A special place for students to fall in love with reading. Our favorite part of setting up a classroom is creating the reading area/library! 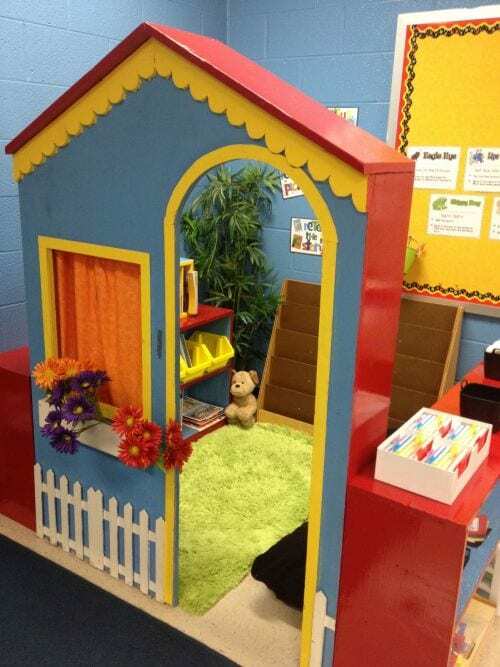 As you design your classroom, remember to foster a love for reading by creating a nook your students will really enjoy. 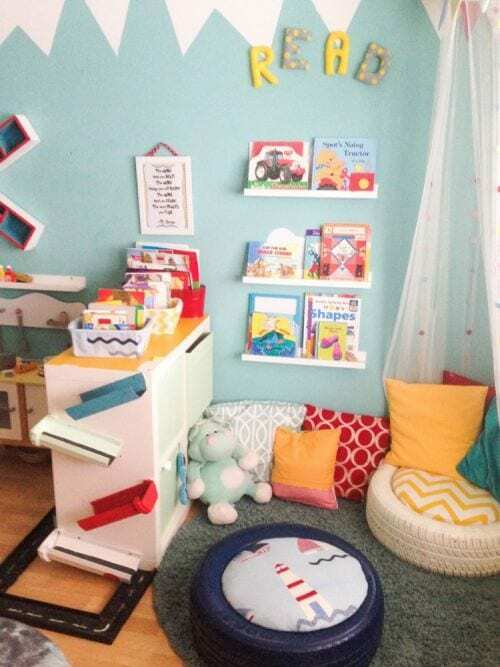 Energize them with pops of color, playful patterns, and special furniture that brings out the joy in opening a book. In return, they’ll get lost in a story and the space. 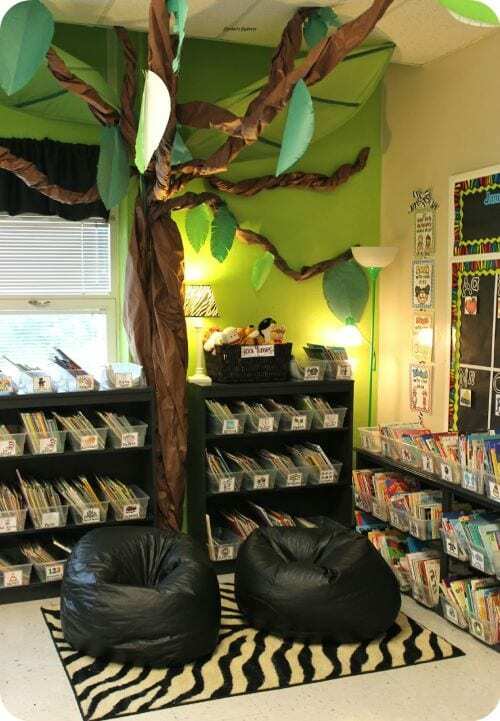 We’ve gathered some of our favorite classroom reading nooks from around the web. These are seriously cute! 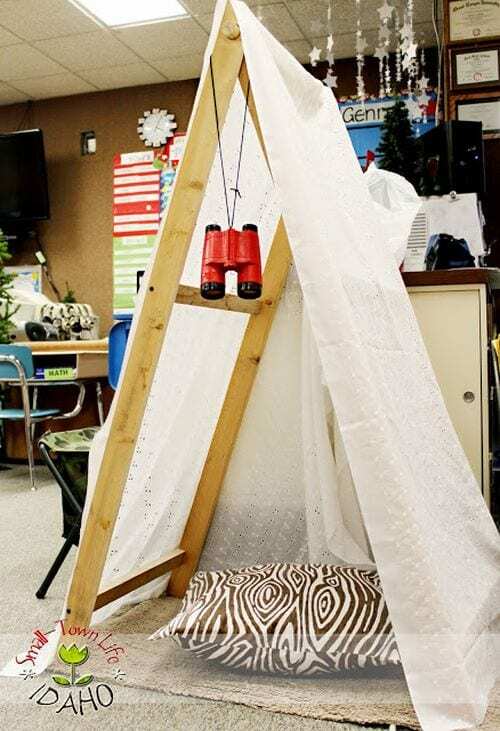 Drape your fabric of choice over a simple frame to create a tent your students will beg to climb into. Messy little hands leave a stain on the tent? Toss the fabric and try again – the base of this concept can be used year after year. Plus, if you bargain shop you can grab a deal on discount fabric. Now that’s what we call glamping. 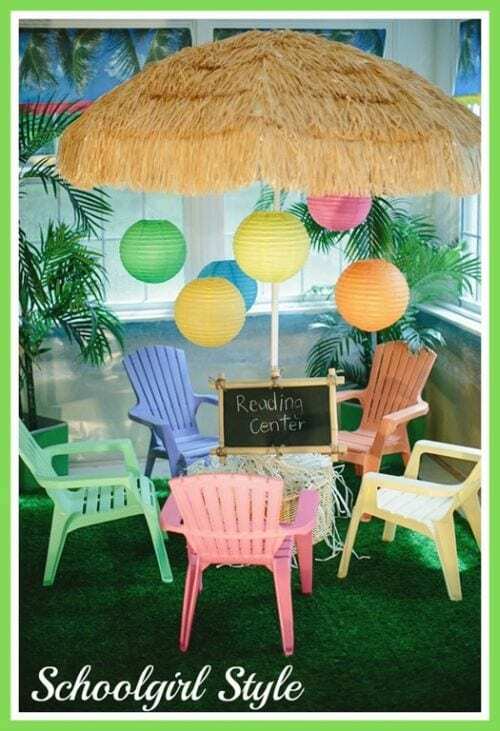 Give your reading nook a luau feel with a thatched tiki umbrella anchored in a bucket of cement. Surround it with colorful kid-sized Adirondack chairs and hang paper lanterns above. Real or artificial palm trees complete the blissful oasis. We’ve seen different versions of reading boats, so the WeAreTeachers team decided to create our own. This reading boat was made from two big cardboard boxes. We used one box as the main seating area for the boat. Then we used the second box to shape the front of the boat. Next, we added a sail by using a PVC pipe, canvas (which came from dropcloth), and pipe insulation for the edges. Of course, we know students can be hard on pieces like this, so we made sure to safely secure the sail at the bottom of the boat with tape and extra cardboard. The entire piece really shows what you can do with the magic of cardboard! Create a scene that’s both visually appealing and practical. 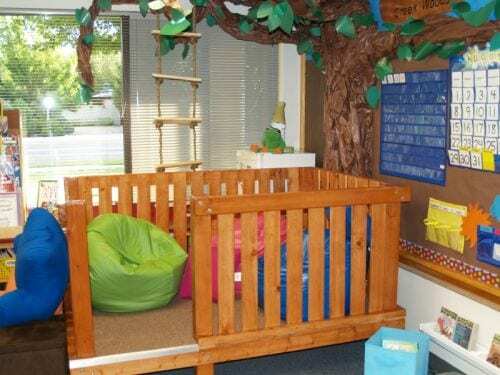 These space-saving classroom reading nooks are ideal for classrooms with limited square footage. Design from the top with a fluffy gem-filled cloud to add dimension. What teacher isn’t looking for a way to save money? These upcycled tire seats are a great way to do it. Paint the tires and make simple padded seat cushions; the cushions lift off so books can be stored underneath. Bring the outdoors in with a jungle-themed reading corner. A large tree is tucked into the drop ceiling and supported by the classroom wall to create an anchor for this design. Now all you’ll need are beanbag chairs and a patterned rug to make the room come alive. More upcycling, this time with milk jugs. 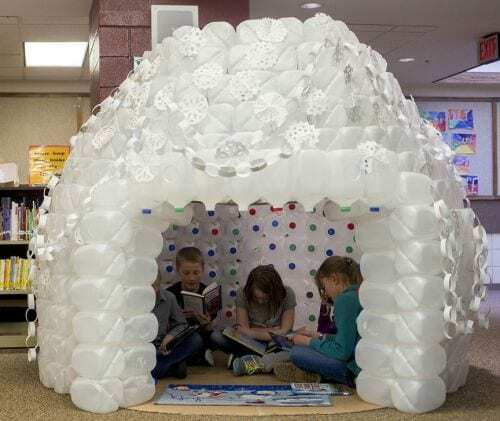 Rescue these ubiquitous plastic containers from the trash and use them to build an igloo instead. Decorate it with paper snowflakes and toss some pillows and blankets inside for a comfortable finish. Kids of all ages want a net for their bed. Think back to your childhood–am I right? 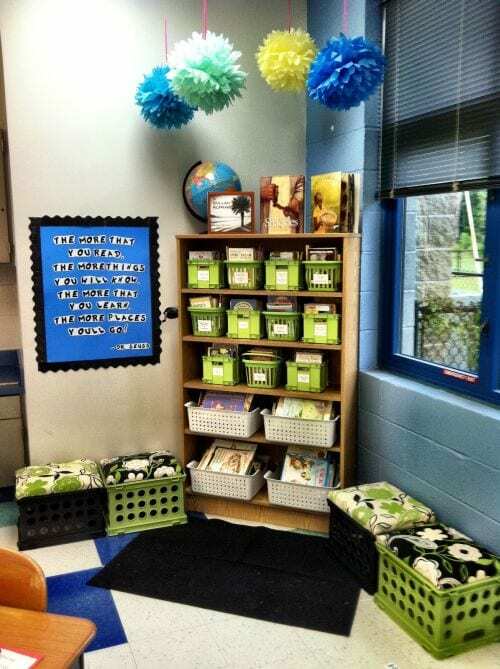 These simple, white nets make a budget-friendly statement for the classroom, too. Hook it to your ceiling and drape paper star garland from the rim to create a fairytale escape. Maybe simplicity is your style. 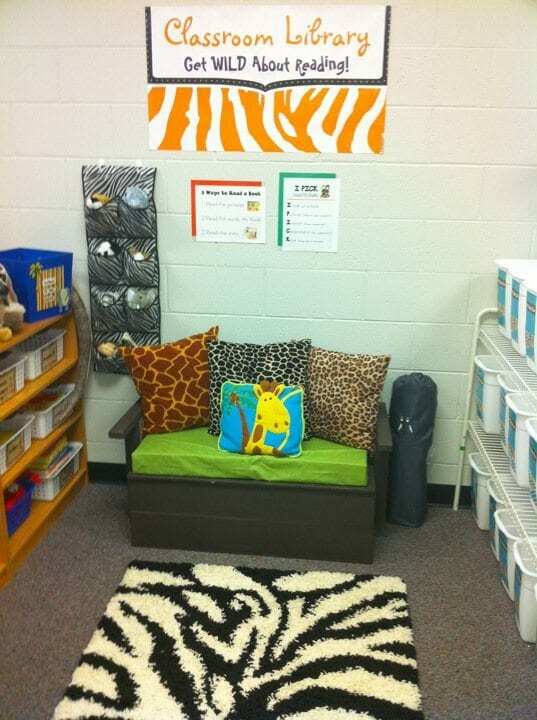 A patterned rug and bright-colored pillows will entice your student’s senses. Design the space around a library shelf to create a unique open-concept reading corner. Every kid dreams of a treehouse where they can read and dream in private. This peaceful corner is slightly elevated, but not so high that you need to worry about safety. Build an artificial tree above to add to the fun. 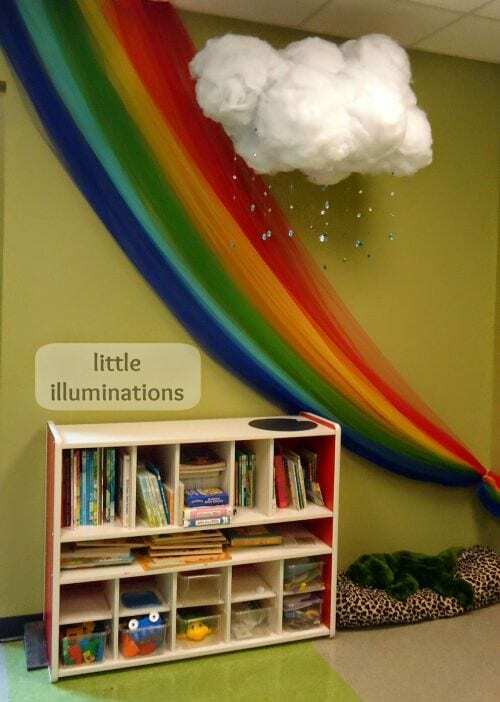 Create a twinkling corner of your classroom with this nighttime idea. 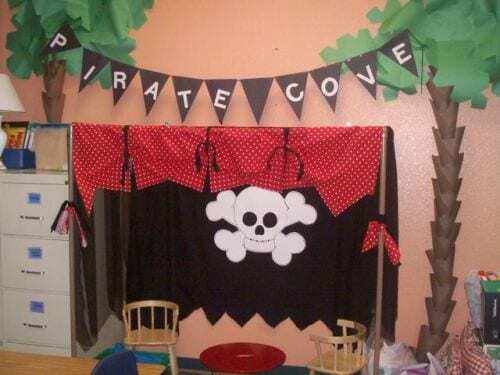 Drape blue fabric (bonus points for blue fabric with stars) from your classroom ceiling, creating a fort. Use a strand of white holiday lights to produce an ambiance you’ll appreciate as much as your students. 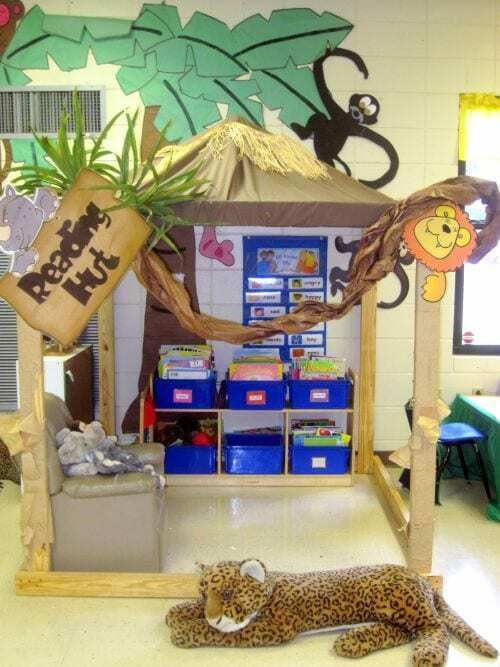 We’re not saying your classroom is a jungle, but if it sometimes feels that way, this reading corner might be just what you need. Knock together a simple frame structure and deck it out as a reading hut. A comfy chair and bins of books nearby, plus some plush animals for snuggling, make this a space a natural hit. This theme can be easily customizable depending on the fabrics and craft paper you have on hand. A friendly skull cutout acts as the base. Or, ditch the skull and rework the idea to fit your needs by choosing different words for your banner. Reading nook bathtubs have been popular for years, and there’s a reason why – kids love them! Visit architectural salvage shops to find an old claw-foot tub, then fill it with plump pillows and snuggle on in. Feeling crafty? You can paint the tub in vivid colors or even decoupage book covers all over it. 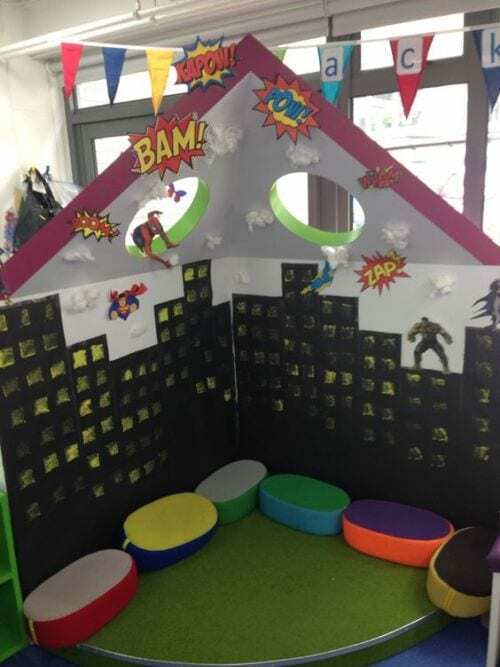 We know – not every teacher has time to build a house structure for their classroom, but you can still pull inspiration from this creative example. Keep your eyes peeled the next time you’re out thrifting; maybe you’ll find an inexpensive existing structure that you can repaint to fit your needs. All you need are bright cushions on plastic milk crates to create a comfy corner that’s ideal for reading. 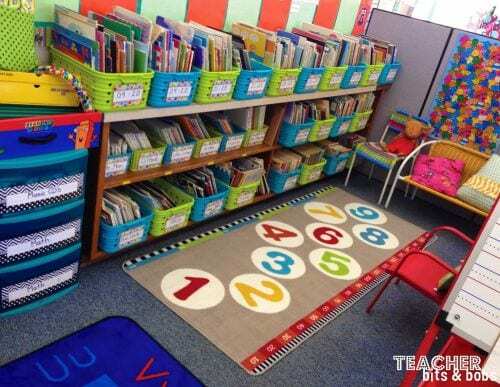 Color-coordinate them with storage baskets full of books and add a few vibrant accents for an easy setup your students will love. Think about your own home: are there any pieces of furniture that you can repurpose for your classroom? Maybe you have a chair that no longer fits in your living room or an ottoman that gets very little use. Grown up furniture isn’t off limits; tailor it to your students by adding colorful patterns and fun fabrics. You simply cannot go wrong with color in a classroom. Think complimentary colors, but don’t stop there. 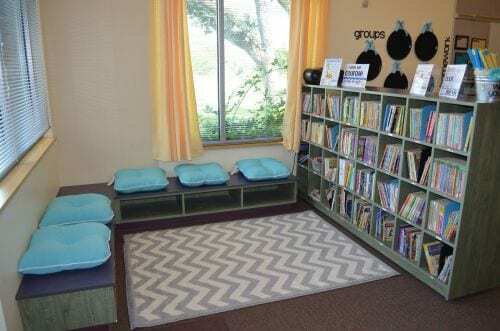 Classroom reading nooks are some of the few places you can really push boundaries when it comes to pairing different shades and tones. Go bold or go home! 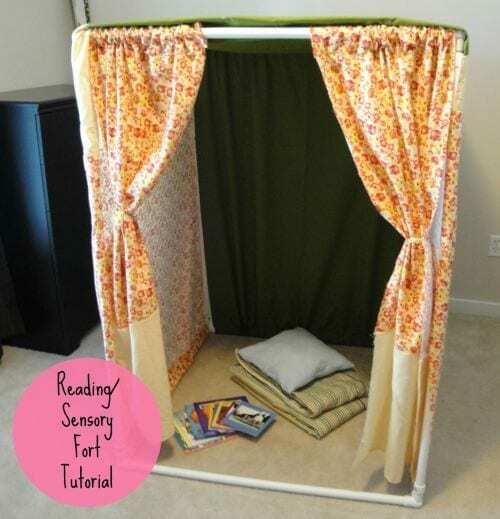 A little quiet goes a long way when creating a good reading space. 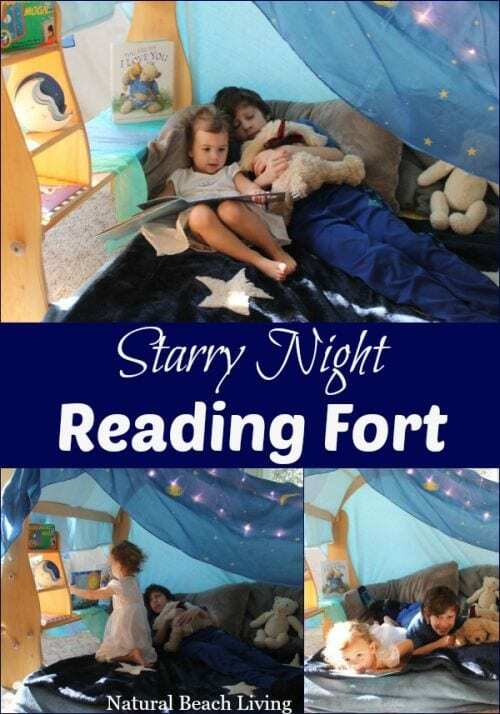 This DIY fort is surprisingly easy and inexpensive to build from PVC pipe and fabric (get the complete how-to at the link above), and gives kids a place to block out distractions and focus on the book at hand. Fill your reading nook with wild stuffed animals as a cuddly incentive for students. Throughout the summer keep your eyes peeled for animal print rugs, blankets and pillows to accent your space and start the school year off with a roar. 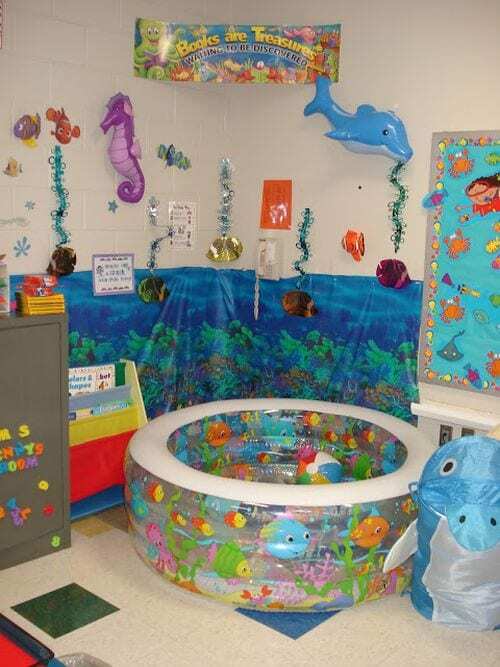 Head under the sea and make a splash with this fun reading nook! Blow up a colorful inflatable pool and add a few beach balls for cushions. Throw in a few sea creatures and an ocean background, and you’ve got a vibrant space perfect for floating off with a good book. Harry Potter may be responsible for more fanatical readers in this new generation than any other character. Why not welcome him into your classroom? This magical reading nook is filled with details that fans of the books will love, and spark the interest of those who are reading them for the first time. 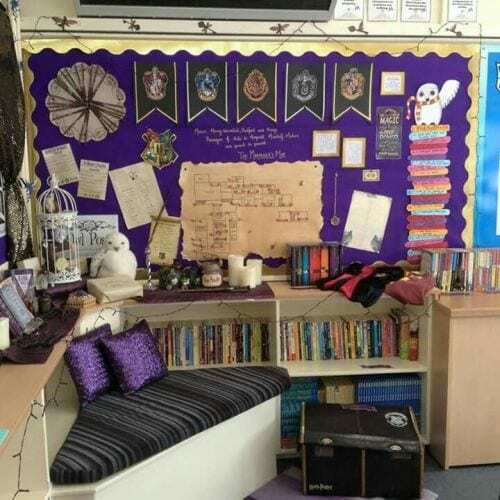 What does your classroom reading nook look like? Come share your photos and chat with us in our Facebook group just for teachers—WeAreTeachers Chat. What Do We Mean When We Talk About STEM?